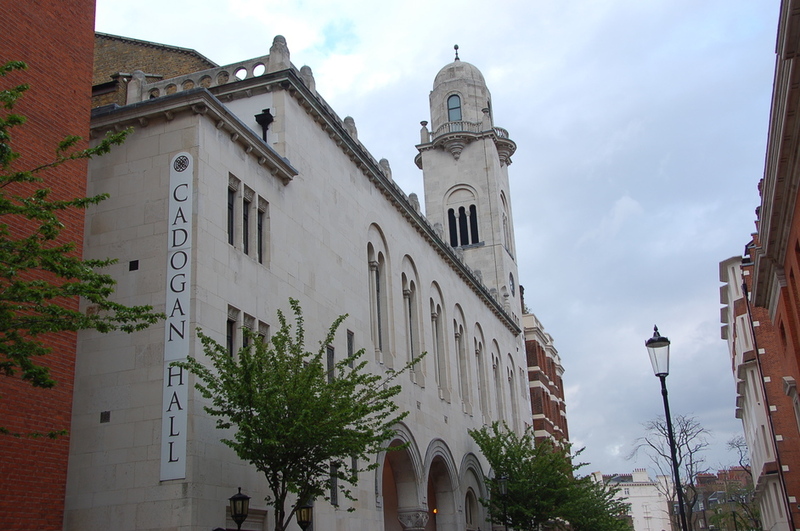 Cadogan Hall opened its doors on 18th June 2004 with a surprising lack of fanfare but is making up for that with a year of 10th anniversary celebrations in 2014. The former Church of Christ Scientist is home to the Royal Philharmonic Orchestra, the least elitist of London's major orchestras. The sheer walls and steep barrelled roof of the 965-seat auditorium give it a great acoustic: crisp, clear and VERY loud. Originally constructed in 1901, this is a lovely example of the Byzantine style of church-building, with a gorgeous Art Deco interior, that puts the bleak modernism of the Royal Philharmonic Orchestra's former South Bank home to shame. Alongside the smaller Wigmore Hall, this has a claim to be London's most attractive dedicated classical music venue. Bolshoi Principal Artists Maria Alexandrova and Vladislav Lantratov perform with the student company as they present ballets by Marius Petipa and Alexander Gorsky. Aidan Oliver conducts the choir, James Allen's Girls' School Holst Choir and the City Of London Sinfonia in Mendelssohn's Elijah, with soprano Sarah Fox, mezzo-soprano Catherine Hopper, tenor Andrew Henley and baritone Neal Davies. Toby Purser conducts the orchestra in Beethoven's Piano Concerto No 2 with soloist Pavel Kolesnikov and Beethoven's Symphony No 9 'Choral' with the London Philharmonic Choir, soprano Marlena Devoe, mezzo-soprano Angela Simkin, tenor Mark Milhofer and baritone Felix Kemp. Gabriel Bebeselea conducts Enescu's Suite No 2, Saint-Saens's Violin Concerto No 3, Porumbescu's Ballade For Violin And Orchestra and Mozart's Symphony No 41 'Jupiter'. The soloist is Alexandru Tomescu. Michael Waldron conducts Elgar's Serenade For Strings, Britten's Serenade For Tenor, Horn And Strings, Holst's Six Folksongs For Choir and Vaughan Williams's Serenade To Music. The soloists are tenor Andrew Tortise and Ben Goldscheider on horn. West End stars, a 16-piece orchestra, guest choirs and dancers present classic songs from children's animated films of a bygone era. The Albania-born violinist, accompanied by pianist Tom Bach, performs Debussy's Sonata For Violin And Piano, Enescu's Sonata No 3 In A Minor, Elgar's Sonata For Violin And Piano and Ravel's Tzigane. Prokofiev's grandson, Gabriel, narrates Peter And The Wolf as Christopher Warren-Green conducts a programme for children that also includes Gabriel's acclaimed Concerto For Turntables And Orchestra, Mozart's Toy Symphony and a new work by Tony Britten. The band originally formed by Syd Lawrence performs its big band and easy listening repertoire in aid of the RAF Benevolent Fund. They are joined by singer Sarah Eyden. Russell Keable conducts Lyadov's The Enchanted Lake, Huw Watkins's Symphony and Sibelius's Four Legends From The Kalevala (Lemminkainen Suite). What are the best dining options near Cadogan Hall London? Cadogan Hall gyms, sporting activities, health & beauty and fitness. The best pubs near London Cadogan Hall. Cadogan Hall clubs, bars, cabaret nights, casinos and interesting nightlife. Where to have your meeting, conference, exhibition, private dining or training course near Cadogan Hall. From cheap budget hotels to luxury 5 star hotels see our deals for Cadogan Hall hotels, including Draycott Hotel London from 76% off.